As a continuing student of medieval manuscripts, I always am amazed by the stories embedded in their physical structure. We glean information by studying how dirt gets deposited, where a book falls open naturally, or notes placed in the margins. 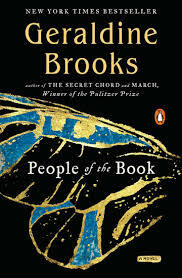 Geraldine Brooks has written a gripping fictionalized tale of a very real and precious document, the 14th-century Sarajevo Haggadah. Our master storyteller is the young woman selected to clean this book—a Jewish text unusually filled with figural art. To view the images, you can click on the illustrations found here. As she works to figure out each anomaly she comes across, a piece of the book’s history is revealed. We follow the volume through the Bosnian war, the Nazi occupation, the Jewish expulsion from Spain, etc., and each era provides its own story and set of characters whose lives impacted this Haggadah. We are introduced to people who risked their lives so that the manuscript could survive. In that commitment, we come to realize the power of the object as witness and the importance of material culture in embodying our history and in defining who we are.